Ooids are tiny grains that are typically composed of CaCO3 either as calcite or aragonite. They precipitate from seawater in concentric bands around a nucleus (for instance a fragment of rock or fossil) in turbulent shallow conditions. Once ooids form, they can accumulate and be cemented to form a sedimentary type of limestone called oolite. 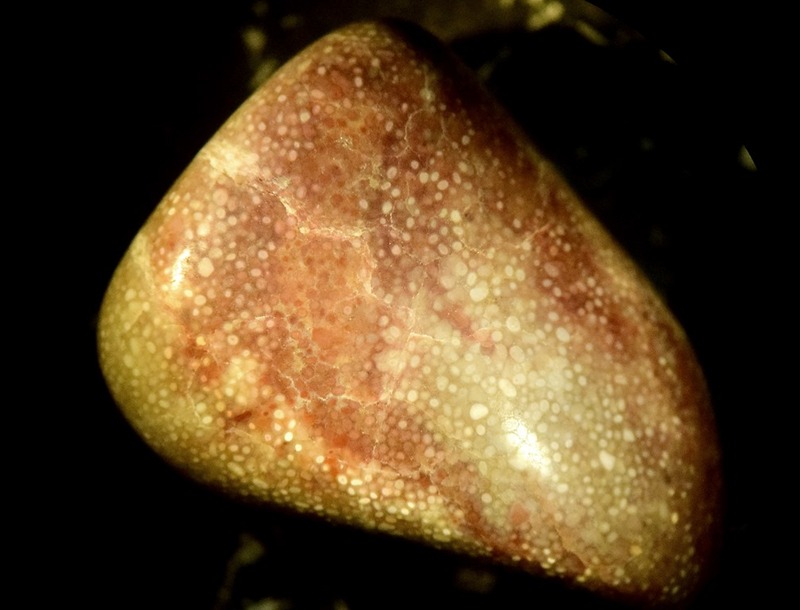 The above picture is a magnified and tumbled piece of oolitic chert collected fromgravel on Crowley’s Ridge in northeast Arkansas. The difference between this and typical oolite is that it came into contact with silica(SiO2)-rich ground water after it formed. The SiO2 then replaced the CaCO3 the rock was initially composed of. The polished surface provides an ideal view of the internal structure of the spherical ooids. This entry was posted in #geoblog, GeoPic of the Week, Sedimentary Features and tagged carbonate, Chert, limestone, ooid, oolite, oolitic chert, replacement, sedimentary rock, silica on May 2, 2018 by argeology. Pictured above is a mineralized vug (approximately 3 inches long) in chert. A vug is a void or open space in a rock. Many vugs are filled with minerals after water that is saturated with a certain mineral flows through the rock. This mineralization can happen in multiple stages. The vug above was initially filled with silica-rich fluid therefore quartz precipitated out of solution and lined the walls of the vug. Afterwards calcite precipitated, as is evident from the larger crystal on the interior left of the vug. This vug is present in a section of ornamentally banded chert. Chert is a sedimentary rock made up of microcrystalline quartz. It can be a variety of colors or banded and quite beautiful. The chert above is Devonian age (416-359 million years ago) from northwest Arkansas. This entry was posted in #geoblog, GeoPic of the Week, Sedimentary Features and tagged banded chert, Calcite, Chert, mineral, mineralization, minerals, silica-rich fluids, Vug on April 28, 2017 by argeology. 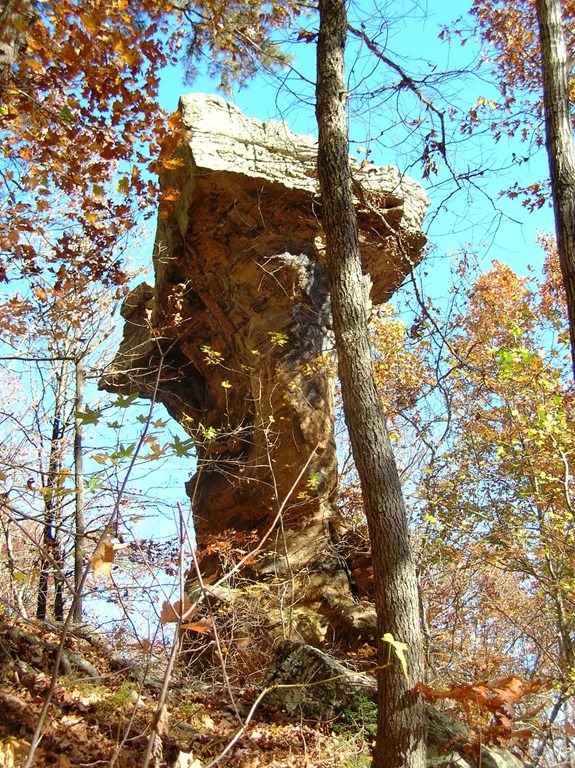 The photo above shows an unusual rock column located near Parthenon in Newton County. Judging from the man standing at the base, it is probably over 100 feet tall. Recently, I was asked what to call these impressive features. The term we’ve used at the Survey is buttress, which is defined by the Glossary of Geology as a protruding rock mass on, or a projecting part of, a mountain or hill resembling the buttress of a building; a spur running down from a steep slope. Example: a prominent salient produced in the wall of a gorge by differential weathering. We’ve used the term buttress, instead of other terms like pinnacle or rock pillar, because these terms refer to a free-standing column of rock, whereas a buttress is, at least nominally, attached to the bluff line. The term also differentiates these particular features from others that are similar in shape, such as pedestals or hoodoos, which typically form in clastic rocks like sandstone and siltstone. Their development is controlled by joints, which are planar fractures with no displacement, and by the presence of a resistant caprock, which acts to protect the underlying, less-resistant rock from weathering as quickly. This process leads to a characteristic shape that is wide at the top and narrower below. A buttress, on the other hand, is typically either uniform in diameter or may taper slightly towards the top, probably because they develop in fairly homogeneous rock. 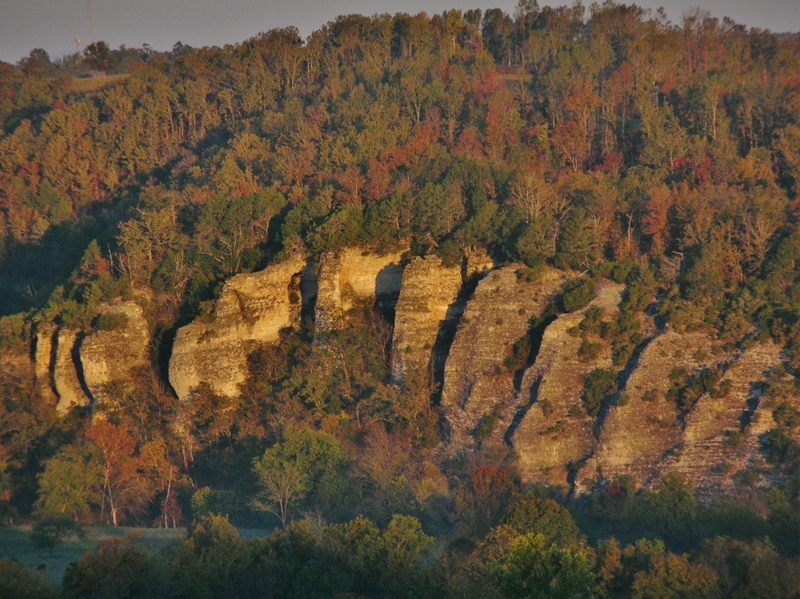 Buttresses are known to be present in two locations in Arkansas: along the Little Buffalo River near Parthenon in Newton County and along Bear Creek near Silver Hill in Searcy County. 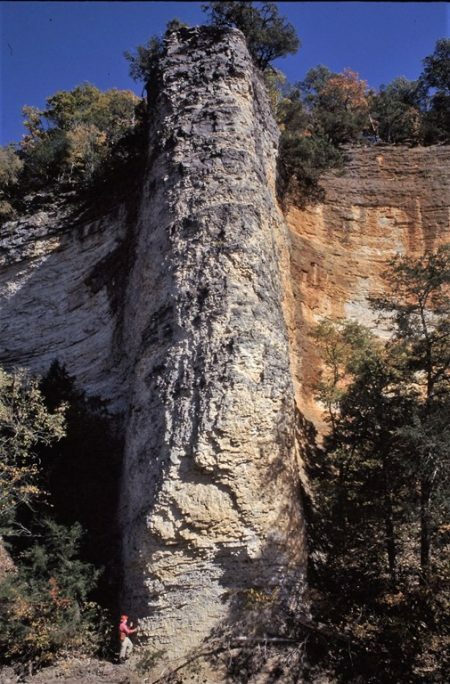 They are all developed in the Mississippian Boone Formation which averages about 320 feet in thickness, and is composed of interbedded limestone and chert. 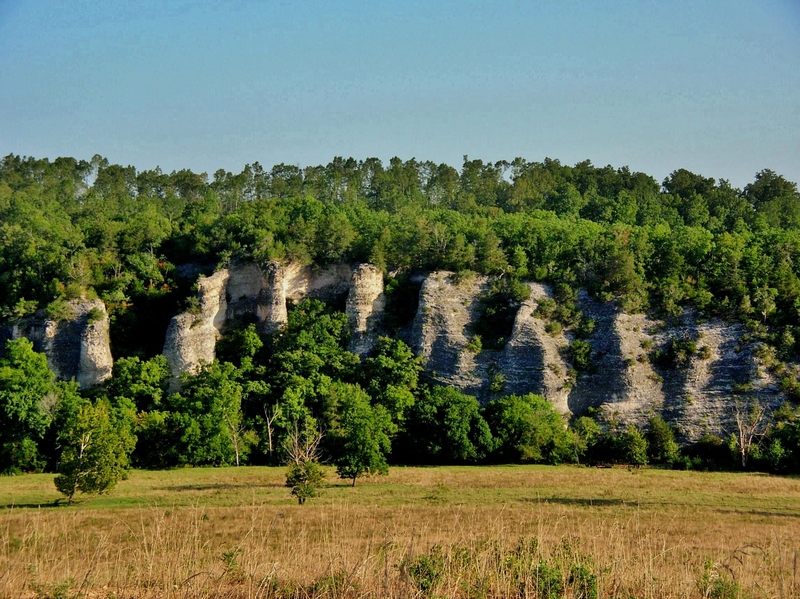 Limestone is dissolved by slightly acidic surface and groundwater, and over time this process leads to many unusual surface and subsurface features known as karst. Buttresses are one such feature. The exact mechanism for their development is poorly understood, but some of the factors that contribute to their formation are known. 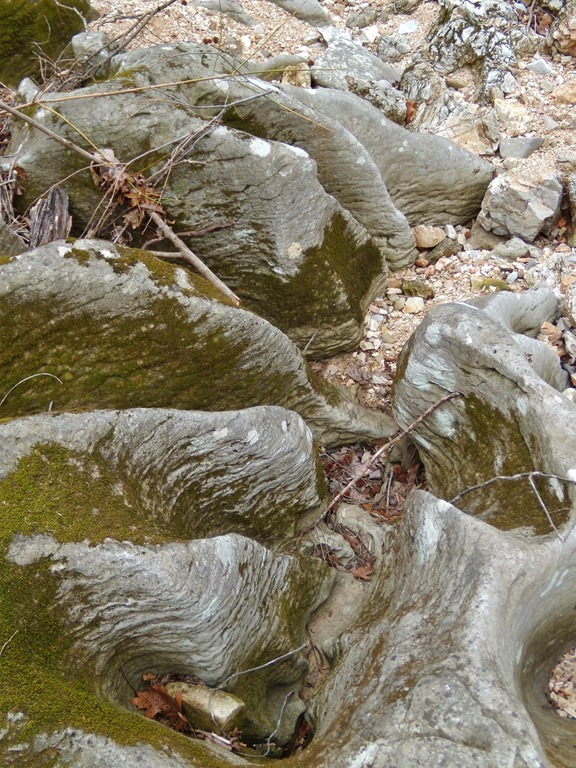 First, dissolution of limestone can produce similar shapes on a small scale, as seen in this photo of coarsely crystalline Fernvale Limestone in a creek bed. This process may be all that is needed to produce the buttresses at a larger scale. Second, all rock units have planes of weakness due to the regional history of tectonic stress. 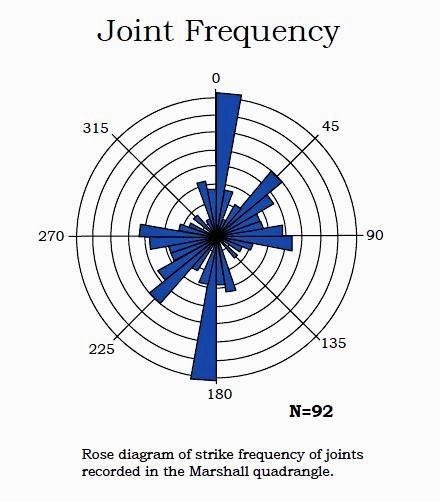 This stress is usually expressed as a joint system, and is one of the most commonly observed structural features in an outcrop. Observations at these two sites have shown that jointing is poorly exposed, but as you can see from the aerial photograph on Bear Creek, weathering of the buttresses roughly aligns with the most prominent joint trends in the area (N/S and NE/SW) as indicated by the joint diagram from the Geologic Map of the Marshall Quadrangle. So even though the joints are poorly developed, one can interpret that pathways for water preferred these orientations, enlarged them over time, and left the buttresses as erosional remnants. However they occur, they are certainly beautiful rock formations and worthy of further study. Many thanks to Angela Chandler for the featured image! 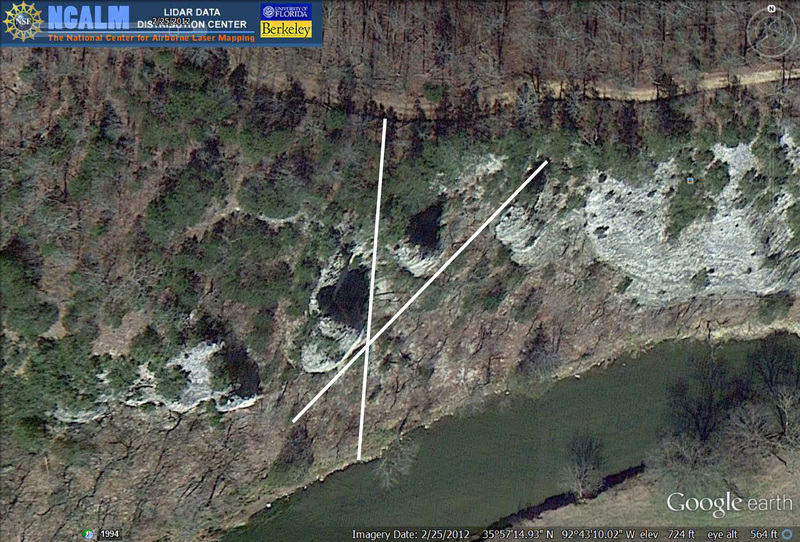 This entry was posted in Notes From The Field and tagged Arkansas, Bear Creek, Boone Formation, Buffalo River, buttress, Chert, Geology, karst features, limestone, Little Buffalo River, Mississippian, Ozark Mountains, Springfield Plateau on February 3, 2017 by argeology. This entry was posted in More Views and tagged Chert, Ouachita Mountains, structural geology, tight folds on February 20, 2015 by argeology.